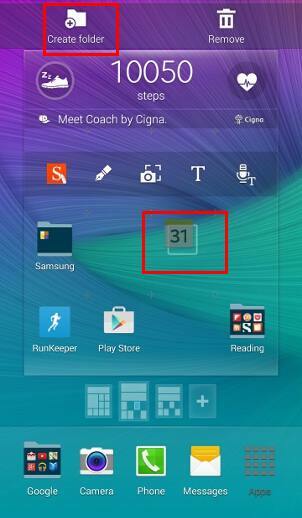 You are here: Home / Galaxy Note 4 How-To Guides / How to create app folders on Galaxy Note 4 home screen and app drawer? When you have more than 100 apps in your Galaxy Note 4, you probably will feel the pain of locating an app, especially for the ones that are not used every day. You may scroll pages after pages just to find the app. Samsung TouchWiz has a nice feature to help you: you can create app folders on Galaxy Note 4 home screen and app drawer to organize your apps. So, it is not necessary to keep so many pages in home screen and app drawer. With 3-4 home screen pages, you usually can get your apps and widgets well organized. However, the way of adding app folders on Galaxy Note 4 home screen and app drawer is slightly different from that in previous Galaxy Note devices. 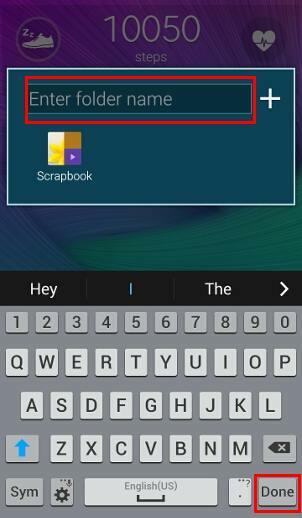 This guide is here to show you how to quickly add or create app folders on Galaxy Note 4 home screen and app drawer so that you get a well-organized home screen (and app drawer as well). How to create/add app folders on Galaxy Note 4 home screen? 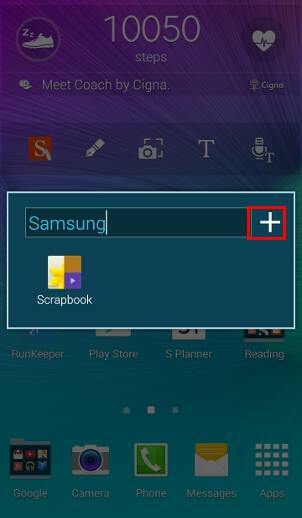 There are at least 3 different methods to create/add app folders on Galaxy Note 4 home screen. Step 1: in the home screen, tap All apps icon (16 dots) to enter app drawer. Step 2: tap and hold the app to be added to the home screen. 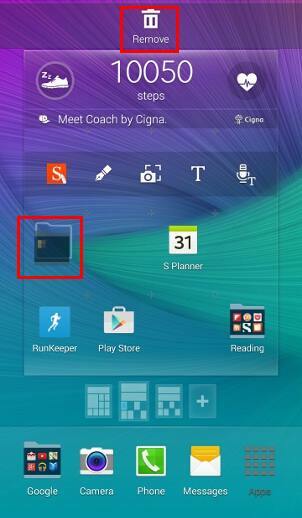 Step 3: drop the app to “create folder” icon in the top of the home screen as shown below. Step 4: give the folder a name. As an option, you can add more apps to this folder created. Of course, you can add apps to this folder later. Step 4A (optional): Tap the “+” sign to optionally add more apps to the the folder just created. Step 4B: Once selecting all desired apps, you can tap Done to finish. A new folder will be created on the home screen as shown below. You can also move existing apps on home screen to the folder by tapping and holding the app, then dropping it into the folder. In the home scree, tap and hold any apps, then drop it into the “create folder” icon in the top left of the home screen as shown above. The subsequent procedures are exactly identical as mentioned above in Method 1. 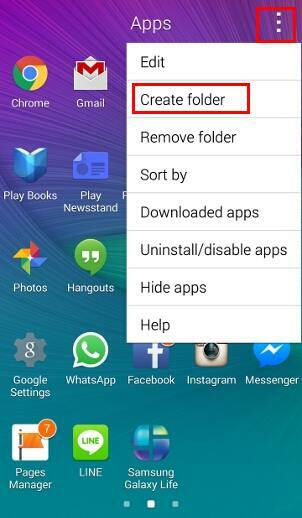 In the app drawer, you can also create app folders (read below on how to do this). You can tap and hold the app folder in app drawer, then drop it on the desired location of the home screen. Essentially, this will duplicate (actually, it is just a symbolic link of) the app folder to home screen. All apps inside the app folder will be available in home screen in the folder with an identical name. 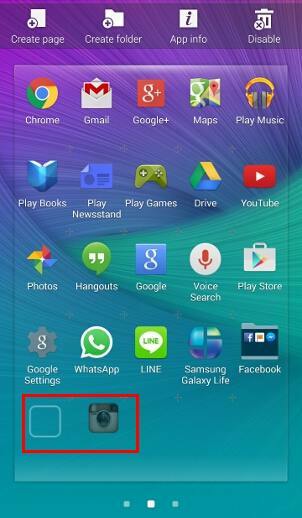 How to add apps to app folders on Galaxy Note 4 home screen? 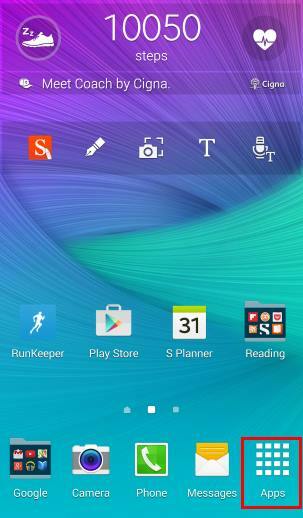 Once you create app folders on Galaxy Note 4 home screen, you can add more apps to the folder whenever you want. You can simply tap the folder on the home screen. The app folder will be expanded and you can then tap the plus button to add more apps to this folder. You can also tap and hold an app from app drawer or home screen, then drop it to the folder. You can add many apps to one folder. But by default, the expansion window only includes the first 12 apps. You need scroll down to access more apps. 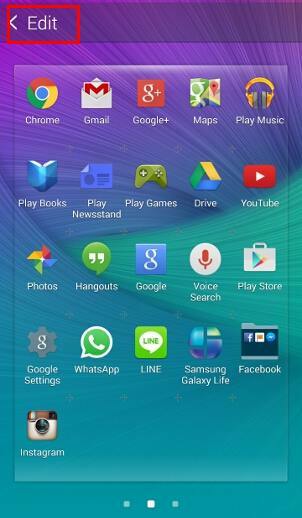 So, it is recommended to keep only up to 12 apps in one app folder in Galaxy Note 4 home screen. It is more efficient to create another folder if you try to cram more than 12 apps into one folder. 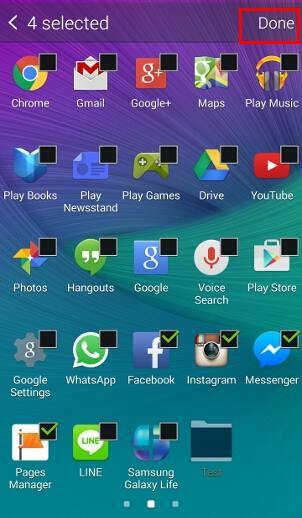 How to remove apps from app folders on Galaxy Note 4 home screen? You can tap the app folder on Galaxy Note 4 home screen. Once the folder is expanded, tap and hold the app, then drop it to desired location in the home screen. You can also create a new folder for it, or remove it from the home screen. 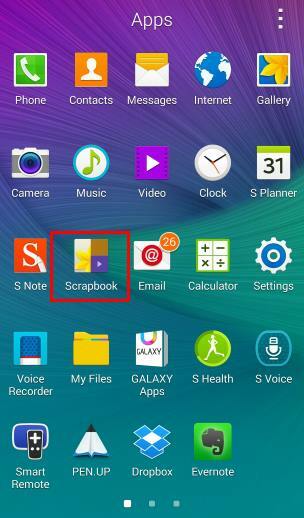 How to delete app folders on Galaxy Note 4 home screen? Tap and hold the app folder on the home screen. Drop it to the Remove button on top of the screen as shown below. 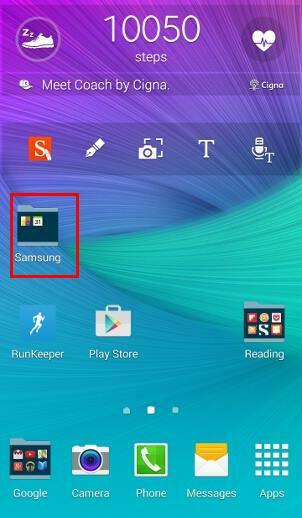 How to use folders within app folders on Galaxy Note 4 home screen? You cannot use folders in app folders. 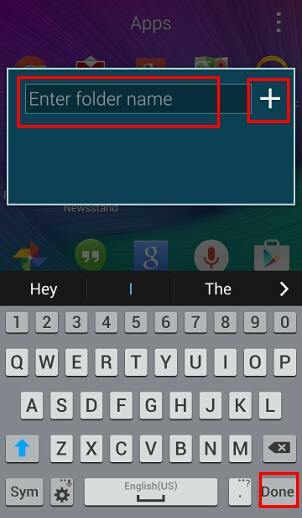 In other words, app folders on Galaxy Note 4 does not support nested folders. You have to create another app folder on the home screen. 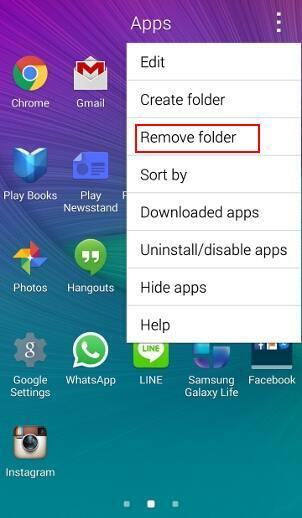 How to create/add folders on Galaxy Note 4 app drawer? 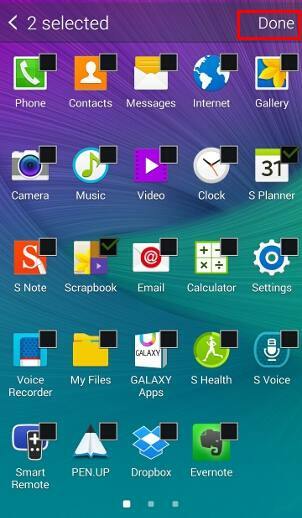 You can create app folders in app drawer to organize your apps installed on Galaxy Note 4. In the home screen, tap all apps icon (the 16 dots) to enter app drawer. Enter the name of the app folder to be created. Then tap “+” button. Select apps to be included in this folder. Tap done once finishing the selection. Now you can see the folder you just created. 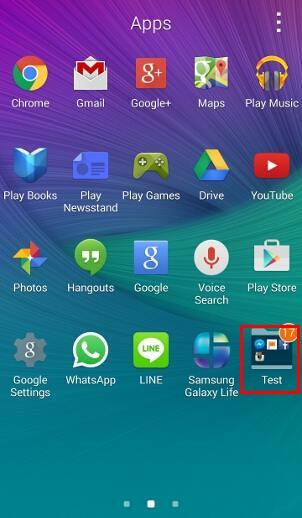 How to add apps to app folders on Galaxy Note 4 app drawer? Similar to app folders on home screen, the app folder will be expanded once you tap it. You then tap the “+” button to add more apps to this folder. Please note, in app drawer, you cannot tap, hold and drop to add an app to app folder, as in home screen. 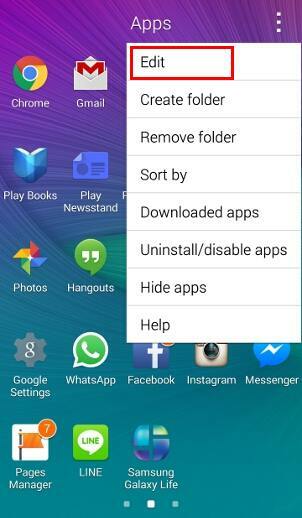 How to delete apps from app folders on Galaxy Note 4 app drawer? Deleting (removing) apps from an app folder in app drawer is a bit tricky. You need tap the menu button (3 vertical dots) in the top right, tap edit to enter editing mode as shown below. In editing mode, tap and hold the app. Drop the app to the desired page or location. Now the app is removed from the folder. Of course, you can create a new app folder for this app, check app info, or uninstall the app as normal. Tap Edit button to exit edit mode. 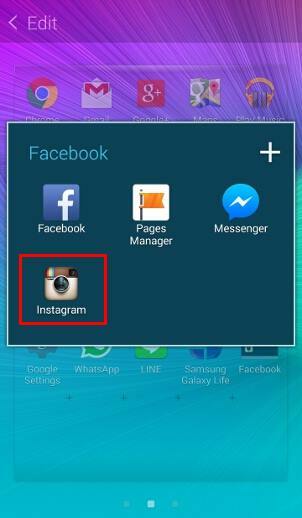 How to delete app folders on Galaxy Note 4 app drawer? 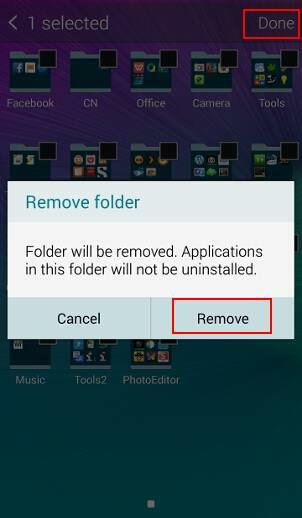 There are two ways to remove app folders on on Galaxy Note 4 app drawer. In the app drawer, tap the menu key (3 vertical dots) in top right. Confirm the removal. As the warning messages tells, the apps inside the folder will not be uninstalled or disabled. They will be shown as individual apps in app drawer . Tap done to finish the removal of the app folder. Method 2: tap and hold the app folder to remove it from app drawer. This method is identical to that in home screen mentioned above. In app drawer, tap and hold an app folder. Drop it to the remove button on the top. 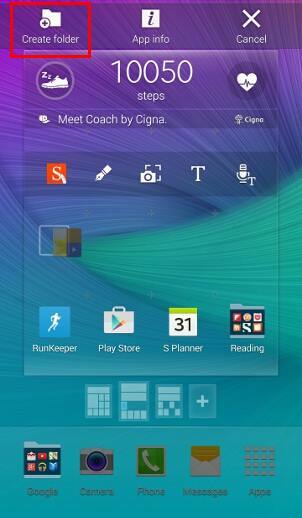 Can you create app folders on Galaxy Note 4 home screen and app drawer to organize your apps now? If you have any problems or questions on creating, removing or managing app folders to organize your apps on Galaxy , please let us know them in the comment box below. We will try to help you find a solution. I moved apps into folders on the app drwer on my note 4, but they are still in the drawer. Shouldn’t this eliminate them from cluttering up the drawer? If you move the app to a folder in app drawer (apps screen), it should not be outside the folder. Apps screen (app drawer) only allow one copy of app icons. Are you talking about home screen, which allows multiple copies of app icons? I have “amazon apps” in one of my folders and it keeps showing me a little number “1” above it. I cant seem to get rid of that number no matter what I do. Please help. The number badge disappears only after you check the notification/message inside the app. Thank you from a novice. Is there anyway to retrieve something dragged to remove/trash can? You can just re-create them. There is no undo option. Great write up, though I”m having trouble finding answers to a question I have. I had Jelly Bean and upgraded to Lollipop. The ability to drag and drop apps on top of each other on the home screen to create their own folders worked as it did before. I recently reset back to factory settings to wipe the slate clean and now the app icons won’t create folders when dropped on one another, they just switch places. How do I enable that feature again? I AM able to Create Folder by going through the App Manager Thanks! On the home screen, you need tap and hold the app, then drag the app to creare folder on top left as shown in method 2. App manager has nothing to do with home screen. I have the same problem, it is doing my head in! Always have to resort all my folders after restarting!! How do I fix this?!?!?! Arrggghhhh!! Didn’t have this problem on my last Galaxy… Changed to Galaxy Note 4 recently and now this issue! It’s probably caused by some task manager or cleaner apps. Do you have any such apps on your note 4? Did you install any task manager or system clean up apps in your Note 4? For some apps on the app drawer, they may be moved out of the folder after being updated. But for folders on home screen, the apps will move out only when you clear data for the launcher. So, a normal reboot should not move any apps out of the folder. workaround: create folder give name but leave empty, then from apps screen, press three dot icon top right corner, select edit,select folder, select ‘+’ select apps to include. select done, select ‘<back'. they will now stay put. Great but after restarting the phone all the folders are empty! You probably wiped the cache partition, or rebooted into safe mode before rebooting into normal mode.. Normally, it should not move the apps out of the folder. Can u change the actual folder icon or style of the folder? As I know, this feature is not customizable. You probably cannot change the style of the app folder. Some third party launchers may allow such customizations. Yes the note 4 folders are the ugliest icons I’ve ever seen. To come from the incredible note 3 folders to this is a joke.